For the most part, I’ve never been particularly drawn to foreign jets. Growing up, it was all about American aircraft – the F-15, F-16, F/A-18, A-6 and so on. But there was always one big, whopping exception – the Panavia Tornado – the twin-engined, swing-wing strike fighter developed as a cooperation between Britain, Germany and Italy. 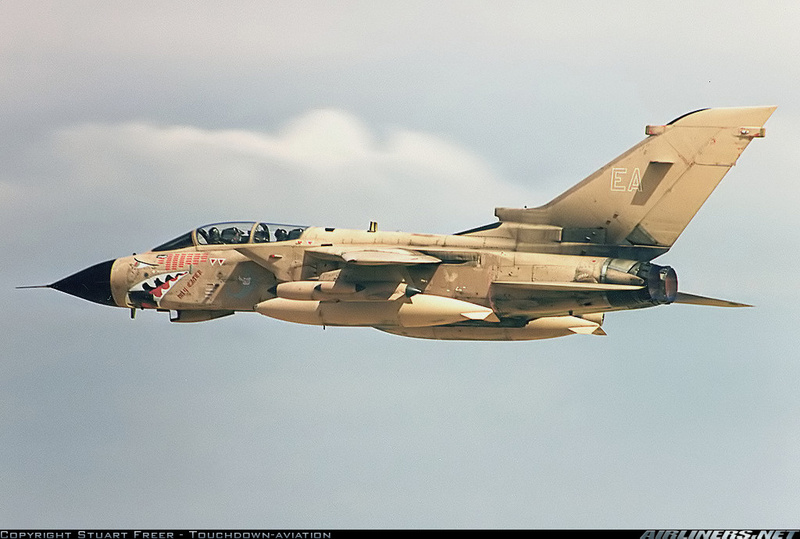 During Desert Storm – or Operation Granby as it was known to the Brits – the Tornado GR.1 was handed all manner of extremely dangerous strike missions. Low-level, high-speed loft bombing runs, strikes against Iraqi airfields, you name it. As a result of the dangerous mission profiles, the Tornado suffered one of the higher loss rates among allied aircraft in the winter of 1991. I’ve always had a weak spot for the Tornado, and honestly it was the aircraft that kind of set off my recent “jet itch”. So what the hell, time to build one! There are a few Tornado kits out there, but I’ve decided to go with the 1/48 Hobby Boss kit. There’s a lot of whinging out there about the shape accuracy, but the kit looks amazing from a detail and build perspective, and in terms of the shape, it looks exactly like a Tornado to me, so I’m not going to sweat it. Stay tuned for some fun! I hope its from 617 Squ. with nose art. Looking forward to watch you wip. Nice website and lovely builds. I added it to my blog. I will follow the Tornado enterprise with great interest – It is one of my favorite jet fighters. Which Hobbyboss kit are you using?